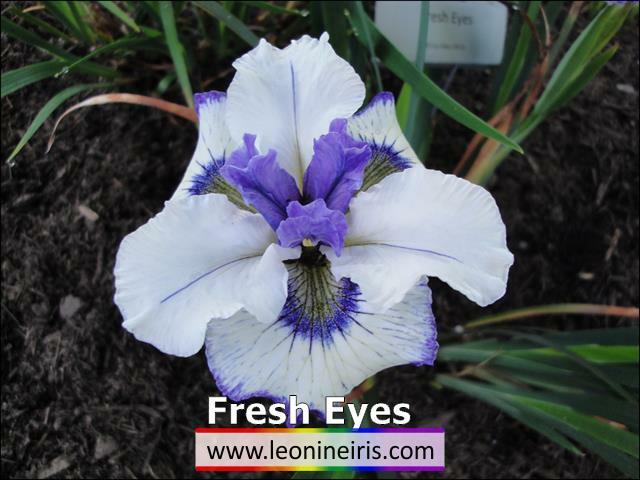 'Fresh Eyes' ( Joseph Ghio, R. 2012) Seedling #KP-154U3. CA, 13" (33 cm). Late bloom. Standards white, blue line down center, small blue lines at distal edge; falls white, light-blue lines radiate from signal, thin dark-blue stitched edge, mid blue halo signal. 'Line Drawing' X 'Finger Pointing'. Bay View 2012.